“The Ern Malley Suite” is A folio of four fine art etchings, they where released at Etching House in December 2004 and sold for $1250 for the set of 4, the Edition is 99 ONLY. – Image size 24.5 x 17 cm, Etching House has been the only one to sell the etchings separately, the series is no longer available other than the stock we have on hand which is now limited. 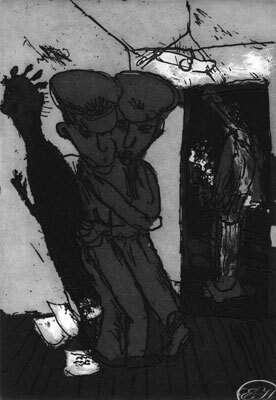 Etching House has the largest single collection in Australia of Garry Shead etchings and prints. Etching House believes Garry Shead is one of the best etchers to come out of Australia for a long time, he is with out doubt world class. Garry Shead has as you may see on the Etching House web site released a Limited Edition book containing three of the most beautiful original etchings from the highly successful and brilliant Ern Malley Series, the book is titled The Apotheosis of Ern Malley and all at only $3300 Book Inclusive yes inclusive, this book has many images of his work and is a wonderful place to just hide away and enjoy yourself. Etching House recently promoted Garry Shead’s book The Apotheosis of Ern Malley at the Melbourne Art 07 Fair with great success, Etching Housealways has stock on hand, Delivery is FREE in Australia, we ship fully insured and person to person, or you may collect personally, or take up our special lay buy offer.